While exploring other KLSE stock using our Black Horse scanner, we found HomeRiz has quite a good setup. 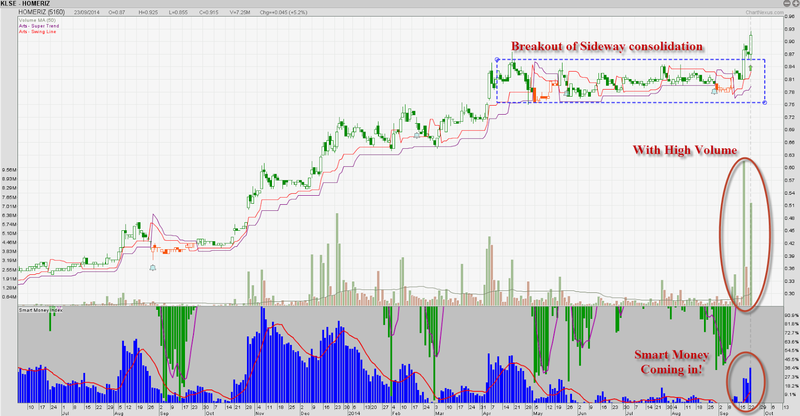 Breakout of sideway consolidation with high volume. This could be a signal that this stock is ready to move to a new level! Big player money spotted with our Smart money index highlighted in Blue bars below. Homeritz Corporation Berhad (Homeritz) is a Malaysia-based company engaged in investment holding and provision of management services. The subsidiaries are engaged in an integrated designer, manufacturer and exporter of a complete range of upholstered home furniture, comprising leather and fabric-based sofas, dining chairs and bed frames. The Company primarily undertakes Original Design Manufacturing (ODM) and Original Equipment Manufacturing (OEM) activities. The Company has also created its own brand of lifestyle furniture series under Eritz. The Company’s subsidiaries include Home Upholstery Industries Sdn. Bhd., U.S. Furniture Manufacturing Sdn. Bhd. and Embrace Industries Sdn. Bhd.